Tonight we’re supposed to get our second snowstorm of the season, both coming in the period of a week. I am feeling a lot better about this one. Why? Because we have a working snowblower once again! It’s been a few years since I’ve had the snowblower worked on. It’s a really old but dependable unit. I think my parents bought it in the 1980’s. It worked great for them, and they gave it to me when they started having someone do their snow. By that time, pretty much the entire guts of the machine had worn down, but the frame and the engine were still going strong. Still, it’d been a few years and I’d been meaning to get it taken back in. I knew that it needed new paddles and probably new spark plugs and some other TLC. November was warm. Really warm. Like late September through early October warm. So I never really gave much thought to the snowblower. I probably should have. I pulled it out and figured I’d see if I could get it started. From experience, I knew that the repair shops were busy with people getting theirs ready for the season. I figured that if I could get it running, I could sneak by for a while and take it in later in the season once the initial rush had slowed. The snowblower decided to let me know pretty quickly that it did not approve of my plan. I got it started, alright, but as I pulled the starter and heard the engine come to life, the entire rope came flying out of the machine. I had no choice but to shut her down. I loaded her up on the back of the truck and took it in. They looked it over, said that it did indeed need new paddles, plus the broken pull. They said it would take a couple of weeks. I joked with the guy that it was not allowed to snow while they had it. He didn’t smile. I figure he’s heard that one before. So what happened? It snowed. A lot. We got a big snowstorm here last Saturday into Sunday. All told, it dumped around 10 inches of snow on our driveway. An amount that a snowblower would have come in handy to get rid of. We ended up splitting the shoveling into two+ phases. We did a first pass with about 4 inches on the ground. It started off as pretty light and fluffy so it was easy. When the next few inches had fallen, I was hoping it would be comparable, but by that point the snow had gotten a lot wetter and a LOT heavier. So the 5″ was 25% more snow than our first pass, but probably weighed twice as much and took twice as long. The next morning, I finished up and cleared the last inch or so. By that point, my shoulder was sore, my muscles were tired, and I was really missing my snowblower. The only saving grace is that when the snow plows came through later in the day, they put all the snow on the other side of the street. I had figured I’d need to do one last pass to clear out the mess that they made, but they didn’t make one! Thankfully, it was good news. They were just finishing it up and it would be ready to go. On Wednesday, I happily drove to the repair shop, paid, and as I walked outside, I heard the familiar engine roar as they brought it out. When the snow starts falling later today, I will be much more relaxed now that I know the snowblower is in the garage, ready to go. Readers, how do you go about clearing snow? Have you ever had to take a step back with clearing snow or some other process? Let me know how it all went in the comments below. Ha! I saw the post title and just KNEW I had to comment! We now live in CO and we just let the snow melt here. LOL well so far it’s looking good for the storm tonight. Seven inches forecasted and not worried. Wow! From the news reports, it sounds like you got the thing repaired just in time for another blast of snow. I’m kind of “DIY guy”….sooo how much does a repair like this set one back? I’m curious…as small engine repair in this neck of the woods…. is like having a “license to print money”…. And this is why I will stay in a sunny state FOREVER! I have no clue what a snowblower looks like nor do I ever want to know. 😉 Enjoy your repaired snowblower and try to stay warm! The snowblower worked fantastic! We didn’t get as much snow as they predicted but it still did the trick. The title reminded me of my past. Even today I do what I used to do during my childhood days. 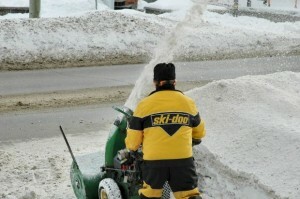 I loved snow blower because I was not allowed to ride a bike or car but snow blower was one vehicle for me. I use to take blower as a Car or Bike then assume that I was driving it. I still do it because it’s fun. Thank you, good old days. Still thankful as we don’t experience much snow in here compared with yours. That said, there is a part of me that I want experience that once in a while. Merry Christmas Money Beagle!